Did you know that Ida Bazonoona’s Health and Spiritual Empowerment curriculum includes … chickens? Ida has a passion for empowerment. She gives villages the tools they need to be empowered emotionally, spiritually, physically, and economically. She gives detailed instructions on how to take care of chickens in the most effective way — and community members take diligent notes in turn. The results speak for themselves. Ida spends the first two weeks teaching community members how to care for eggs to maximize output and to ensure healthy chicks. For instance, it is important to mark eggs in order to differentiate between newer eggs and older eggs. It’s also important to throw out cracked eggs. To maximize yield, Ida teaches community members how to fool their chickens into laying more eggs more often. Instead of hatching eggs only twice per year, the hens can hatch eggs 7 times in a year. By separating hens from their chicks soon after hatching, for instance, the egg yield of a single hen can increase dramatically. Ida’s chicken lessons serve as an economic incentive to come to her other lessons, such as anger management and Bible lessons. These are less tangible forms of empowerment, but they are just as important as financial welfare. Processed feeds are no good, Ida says. It’s better and cheaper to mix your own. To help chicks grow, Ida gives a detailed regimen of cotton seed bread and sunflower seeds. Her speech is interspersed with mention of carbohydrates, proteins, and preservatives. Ida encourages people to mix their own organic feed from their gardens rather than purchasing processed feed from the store. It’s healthier and cheaper. Ida passes around some examples of feed and explains which ones are best for male and female, and baby, adolescent, and adult chickens. During weeks 1 through 8 after hatching, all the chicks receive the same feed. Around 8 weeks, however, it is possible to distinguish the sexes of the chicks. As Ida says, “I grew up with brothers, and at the dinner table, they would eat all the food before I had the chance to take a single bite.” Chickens, it turns out, are the same. Not only that, female chicks need to start preparing to lay eggs. Diet and nutrition can play a big role in helping them grow. Before Ida’s lessons, often chickens are left to scavenge for food and water. Chicks are likely to be eaten by predators when scavenging away from the compound, and they grow to be skinnier. 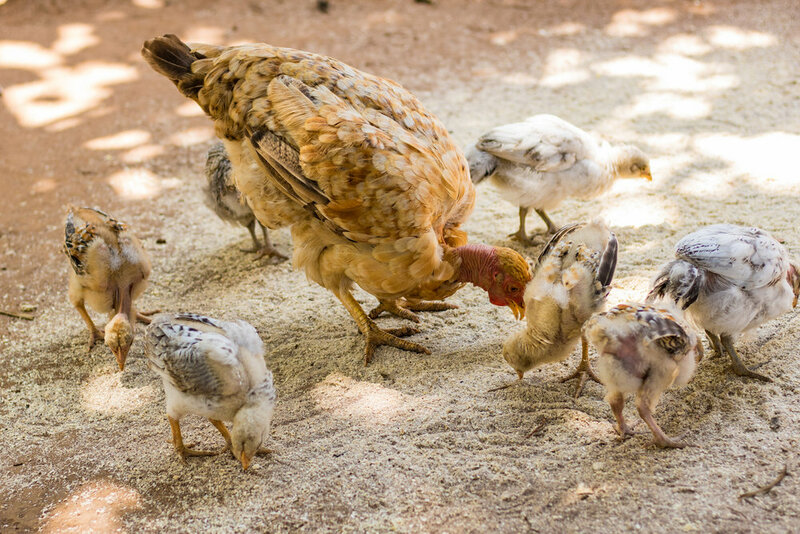 After Ida’s lessons, people know how to mix feed and keep their chickens nearby the compound. The chicks grow up healthier, and it increases their chances of surviving to adulthood. Ida also encourages people to set water aside for chickens so that they don’t drink water out of washed dishes or the family’s drinking water containers, which can spread disease. Keeping chickens strong and healthy is great, but the real killers of otherwise healthy chickens are predators. When chickens go into the bush and away from the compound in search of food, it is common for the hen to return with only half her chicks. By the time morning comes, that number dwindles even more. Cats, snakes, and other predators pick the baby chickens off one-by-one when they venture into the bush. What’s the solution? Feed them closer to home so they don’t have to venture so far in search of food. Build a chicken coop for them to stay safe at night — away from snakes and cats. From a purely mathematical standpoint, preventing the premature deaths of 5 chicks results in an exponential increase in egg yield down the road. Every chick that doesn’t survive to adulthood is money lost for the family. If a family listens to Ida’s lessons and implements simple changes, their chicks are more likely to grow up healthy and safe. Chickens, it turns out, can be a real money-maker. They can be more profitable than goats with proper care. They can be a form of insurance in case of crop failure. They can subsidize school fees or pay them off entirely. If each chicken costs 20 to 30 thousand shillings, which is 6 or 7 dollars, the yearly total of 200 chickens sold can be a game-changer. Of course, not all families can or want to invest the time it takes to increase their chicken yield in the way Ida describes. But for every village in which Ida teaches her chicken lessons, she estimates that three or four families commit to chicken farming and see amazing results. Everyone else who follows her instructions gain a greater number of healthy chickens that provide extra money and food for the family. Like so much of Kibo’s work, Ida’s chicken lessons are aimed toward investing for the future. Money from chicks can help children go to school, help families build savings accounts, and make it easier for communities to get access to the goods and services they need to help the community thrive. What’s the final verdict? By following Ida’s advice and taking a healthy interest in their chickens’ lives, it’s possible for a household to raise as much as $1,000 a year that they wouldn’t have otherwise. Now that’s what we call empowerment.